I have absolutely NOTHING against the Elf. The Elf is fun and hilarious and every year I am impressed by the creativity and execution by mom friends who really rock the elf. Well done. I’ve even seen some moms do a great job of bringing Jesus and the Christmas story into the Elf game. I applaud you! Personally, I don’t do it. I tried it once when my older son was little and I just couldn’t hang. My brain is already challenged and adding one more thing to the list is just not gonna happen. I don’t want to be the mom to mess up the Elf fun. Our family approaches Christmas with a lot of Jesus and a tiny sprinkle of Santa. This is not common in our world and sweet ladies ask my son daily what Santa will bring him this year. Few people ask him how he will celebrate Jesus’s birth. It’s just not how it generally works. He is getting Santa messages everywhere, so it’s my job to reign it in at home. I’m always looking for ways to make God’s Word fun and inviting and interactive in age appropriate ways. Fortunately, our friends from Christmas Star From Afar created a way to keep the story exciting with their daily activity. It’s engaging and fun and reinforces the meaning of Christmas each and every day. It’s indestructible and well-made and has survived for 3 years completely unscathed. I don’t have to be creative AT ALL and can simply move the Star each day. This Mama is grateful for a simple, meaningful and fun activity for our family! From the Website: “The Christmas Star From Afar” encourages children to go on a hunt for their Star, similar to that of the Wise Men. Everyday the Star is hidden and the children participate in a fun hide-and-seek game to locate it. Once they have found their Star they move all Three Wise Men to its location. On Christmas morning the Three Wise Men reach their final destination when the Star is found at the stable with the newborn baby Jesus. 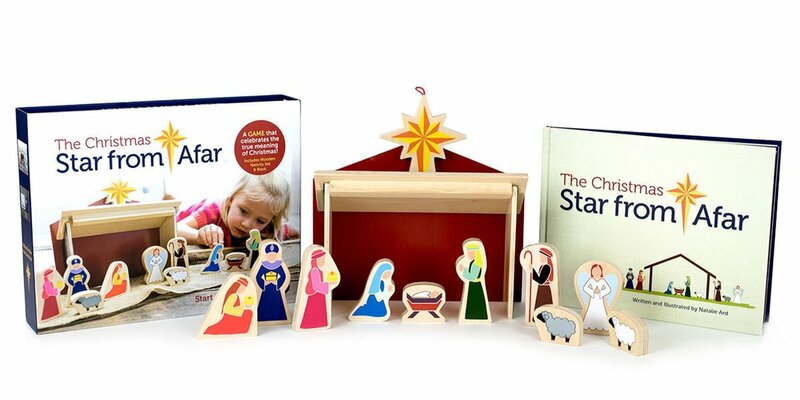 The activity book includes a wooden Star, a full wooden nativity scene that matches the artwork of the book, and optional scripture to use throughout the month.